The Department of Urban and Regional Planning at Cal Poly Pomona is pleased to announce the winners of the 2016 William R. and June Dale Prize for Excellence in Urban and Regional Planning. Dr. Lisa K. Bates of Portland State University has won the Scholar Prize. Mr. Hector Verdugo of Homeboy Industries, Los Angeles has won the Practitioner Prize. The 2016 theme is Planning for Community Self Determination and Racial Justice. 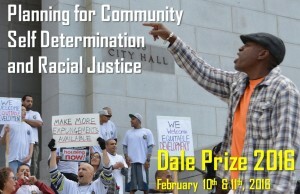 The Dale Prize asks policy makers, developers, and practitioners to reflect on their historic contributions to racially segregated and unequal communities through urban renewal, redevelopment and exclusionary zoning practices. How have planners contributed to racial and spatial inequality? How can we use our collective influence and expertise to alter the course of separate-­and-­unequal treatment of racialized communities? Dale Prize Banquet, 7:00–9:00 pm, W. K. Kellogg House. Banquet tickets cost $30 each. RSVP by January 30, 2016 to Ms. Laura Fujimoto Hernandez at 909 869-­2688 or by email at URPDEPT@nullcpp.edu. Information is also available at http://www.cpp.edu/urp/daleprize/. The Dale Prize is made possible by an endowment provided by the late June Dale, wife of the late William R. Dale. Inaugurated in 2004, the Dale Prize focuses on a different planning theme each year.